It left a path of destruction in its wake. Many people were made homeless and businesses lost as houses, buildings and farms were damaged or destroyed. Thankfully there was no cost to human life as the 300 kilometre winds tore through the World Heritage area and left vast areas of natural vegetation shattered and broken. The sense of community has been amazing and has triumphed over the impact Yasi has dealt to the continuity and every day life in the villages of Mission Beach. There has been a lot of concern for the wildlife within the fragmented landscape and a strong focus is on the endangered cassowary population that was badly affected after cyclone Larry in 2006. 31 birds died in the twelve months following the cyclone, 15 in the Innisfail area, 11 at Mission Beach and 5 in Tully. Birds became needy as food resources became scarce and a practice of relocation was established by the Queensland Parks and Wildlife Service. It is not known how many birds survived the relocations as reports have not been made available. Most recorded deaths were as a result of road deaths, some of dog attack and one of starvation. There are no accurate records of how many Cassowaries died during the cyclone but it is known some did not survive. The more information the less intervention. Bob Irwin has swung into action with an appeal along with the Save the Cassowary Campaign and Rainforest Rescue. Community response as been fantastic. As Margaret Thorsborne says we must give a voice to those that cannot speak for themselves. 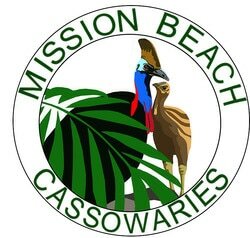 On the ground stories about cassowaries are being told on mission beach cassowaries facebook so please share your news, comments or questions. Three devastating cyclones have hit the Cassowary Coast in 25 years. On February In 1986 high category 3 cyclone Winifred crossed the coast at 7pm just north of Mission Beach at Silkwood. The slow moving cyclone buffeted the coast for more than 10 hours with winds reaching 200 kilometres an hour. Cyclone Larry, a much smaller but more intense category 5 took just five hours to cross the coast at Innisfail early in the morning on 20th March 2006 bringing with it gusts up to 300 kilometres and hour. Just five years later the whole nation watched as massive category 5 cyclone Yasi brewed out in the coral sea in the weeks before moving in a straight line for Mission Beach on the Queensland coast crossing at 10pm 2nd Feb. Those who stayed decribed the experience as terrifying as the 300 plus kilometre winds uprooted huge trees and destroyed homes and buildings.